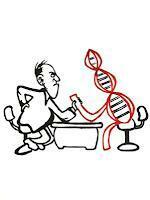 Can A Genetic Test Say Why You Are Fat? With the decoding of the human genome came the hope of getting a lever on the chronic diseases, which kill most of us today: heart disease, stroke, diabetes and many cancers. And since overweight and obesity are a common cause of those diseases, many obese people were, and still are, yearning for that exculpatory headline: "It's all in your genes!" Why and how this headline is unlikely to ever appear in any serious media, was a subject of my earlier post "It's not your genes, stupid!". Now, a group of researchers have looked at the data of a 30-year investigation of health and behavior, which you might call the New Zealand equivalent of the famous U.S. Framingham study . If you ever wondered whether it would make sense to get your children, or yourself, tested for your genetic risk of obesity, you will be surprised to learn what this study tells you. But one step at a time. Let's first have a look at this outstanding piece of research. [tweet this]. The study population consists of all the 1037 babies born in Dunedin, New Zealand, between 1st April 1972 and 31st March 1973 at the Queen Mary Maternity Hospital. Comprehensive health assessments were done at ages 3, 5, 7, 9, 11, 13, 15, 18, 21, 26, 32 and 38. These investigations will be extended into the future and into the next generation. This is a massive and admirable effort. With data having been collected about virtually all aspects of health and behavior, this project provides a rare opportunity to match those data with genetic information. While genetic profiling wasn't possible in the seventies, it is possible and feasible now. And since study participants' genetic make-up hasn't changed since the time of their conception, we can retrospectively look at the correlation of biomarkers and genes, in this case those that correlate with obesity. To understand this study let me familiarize you with some facts and terms first. So-called genome-wide association studies (GWAS) have thrown up more than 30 individual single-nucleotide polymorphisms (SNP, pronounced 'snip'), that's geneticists' speak for a variation of a single building block (nucleotide) of a gene. The draw-back: Those SNPs individually correlate only very weakly with obesity. That is, while there is a statistical correlation with obesity, there are obese people who don't carry the SNP, and there are carriers of the SNP who are not obese. To complicate matters a little further, not all SNPs which show statistical correlations in one population, say the U.S., do so in another, say New Zealand. Which is why the Dunedin researchers developed a risk score from the 32 SNPs known from other studies. Of those 32 they could find 29 in their study cohort, and so they developed their score from those 29 SNPs. Participants were grouped according to their score into either high- or low-risk. The next step was to look at how the participants' genetic risk score (GRS) correlated with BMI in each decade, starting from 15-18 years of age, followed by 21-26 years, and then from 32-38 years. In the second decade (ages 15-18), people with a high risk score had 2.4 times the risk of being obese than those who scored low on the GRS. had this been you, having a high risk score would have made you almost two and a half times more likely to be obese as a teenager compared to your buddies of the low-risk persuasion. That sounds like a lot, and you might be tempted to think that screening your child for that risk score would help you to be more vigilant in watching over his or her BMI while he or she is still under your care. The authors certainly seem to think so when they say that "These findings have implications for clinical practice..." and that "the results suggest promise for using genetic information in obesity risk assessments." I respectfully disagree, and so might you. Let's simply take your point of view for a moment, and not the one of public health, where we are interested in one patient only, the population under our care. In contrast, the only patient you are interested in is you, or maybe your child. This value of a relative risk of 2.4 doesn't tell you much. What you rather want to know is, what a high- or low-risk score means to you. And the right question to ask would be along the line of "what are the chances of becoming obese when my risk score is high?". And also, "what are my chances of not becoming obese when my risk score is low?". The answers to these 2 questions come in the shape of values, which we call positive predictive value (PPV) and negative predictive value (NPV). Unfortunately the Dunedin researchers don't report those values. But we can calculate them, which I did. And here is the surprising answer: if you had a high score, your risk of being obese as an adolescent is just about 10%. In other words, even with a high-risk score, you stand a 90% chance of not being obese as an adolescent. And if your risk score had been low you would have a 95% chance of not becoming obese. Beats me, but I can't see the benefit of genetic testing. I deliberately talk only about the risk at the age of adolescence. There is a simple reason for this. The researchers found that the relative risk of obesity between the high- and low-risk categories diminished progressively from 2.4 in the second decade to 1.6 in the fourth (ages 32-38). That means, our looking at adolescents affords us a look at a time when study participants' exposure to environmental and behavioral influences had been relatively short. Over the years, environment and behavior further diminish the predictive power of the genetic score. Which is akin to saying: your lifestyle choices give you a greater power over your BMI than your genes. And by extension, the choices you make for your children's lifestyle beats their genes easily, too. In other words, it's not so much the luck of the draw, which determines your bodyweight, but rather your skill of playing the deck of (genetic) cards, which we have been dealt at the moment of conception. The study's data say the same thing just in other words: At birth the high-risk babies were not any heavier than their low-risk peers. Only once they were exposed to the outside worlds, did BMI careers begin to divert. For some of them. This tells us one thing: when it comes to obesity, habits and environment are the key, not a potpourri of SNPs. Of course, if you are in the business of peddling genetic tests, you will disagree. And also when selling guilt-free conscience to obese readers is what pays your bills. Which is why I'm curious to see how the media will portray this study. Let's stay tuned. [tweet this]. 1. Belsky, D.W., et al., Polygenic Risk, Rapid Childhood Growth, and the Development of ObesityEvidence From a 4-Decade Longitudinal StudyPolygenic Risk for Adult Obesity. Archives of Pediatrics and Adolescent Medicine, 2012. 166(6): p. 515-521. How Do You Keep Your Cardiovascular System Healthy from Your Fifties Onwards? Weight Loss Aside, What Health Benefits From Intermittent Fasting? The Whole Superfood Thing is Way Overblown! Fake Science: Deviant Science? Or Deviant Journalism?